Aaron Martin scores against Sheffield FC. PIC: Steve Ambler. BRIGHOUSE TOWN could close the gap between them and Morpeth Town to just three points when they host the league leaders on Saturday (3pm). 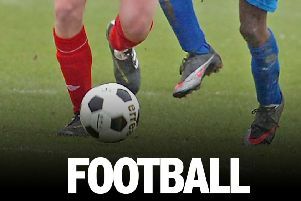 Town moved to within six points of the one-time runaway leaders from Northumbria last Saturday. Vill Powell’s men won 2-1 away to Sheffield FC while the Highwaymen suffered a shock 4-2 home defeat to 14th-placed Cleethorpes Town. Both Town and Morpeth have lost three games each this season - the lowest of the 20 clubs in the Evo-Stik NPL East division - but Brighouse have drawn six to Morpeth’s three and have three fewer victories. The two sides have already met three times this season with Morpeth winning the first league game 2-1 back in August. Aaron Martin was unable to grab a second-half equaliser in that game when he just couldn’t get his lethal right boot on the ball, when a left-footed effort from six yards out would have done it. Town then won 4-3 away in the preliminary round of the FA Trophy before losing 2-0 at the same venue in the second round of Integro League Cup just 17 days later. Town, who took around 100 supporters on the historic pilgrimage to Sheffield, the oldest club in English football last weekend, have gone seven league games without defeat and their form has shown that they really do step things up for matches against the other teams in the top half of the table. And chairman Charlie Tolley has heaped praise on manager Vill Powell after a magnificent start to the campaign. “We are playing with a real air of confidence,” he said. “Once we had settled (at Sheffield) the football was a joy to watch. “The set pieces were from the training ground and the balls played in and around the box, before the trigger was pulled, were top drawer. Morpeth are the best supported side in the division and expected to bring between 70 and 100 supporters, a far cry from when they took 15,000 to Wembley at the end of the 2015-16 season when they beat Hereford 4-1 in the FA Vase final. Elsewhere, Town have rebuffed an approach from Ossett United for centre back Kurt Harris, who returned back to Brighouse in November after 18 months away at Farsley Celtic. The player agreed terms on a contract until the end of the current season. There have also been approaches for midfielder Iwan Heeley and Jack Normanton but the players informed Powell that they saw their futures with Town.